Made by PERKO, who have been making lamps since 1907. The logo on these lamps was used between 1929 and 1953. 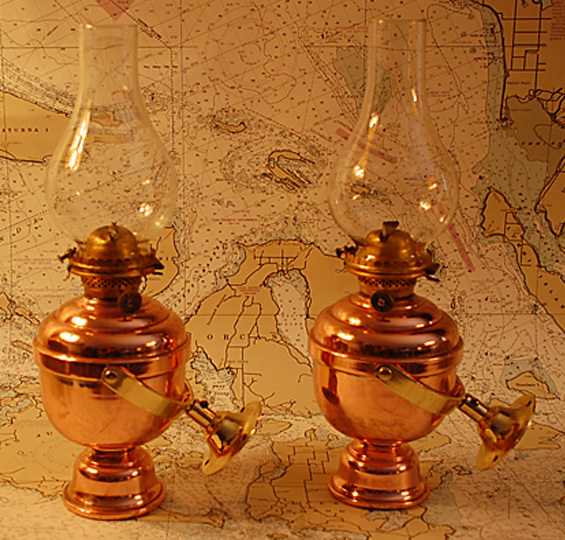 We believe these were probably made in the 1930s because the lamps themselves are made out of the more rare "red" brass, which was more expensive than regular brass because copper is added to the bronze… red brass was use to make cannons because of the strength of the bronze. They are weighted on the bottom and the gimbals work fine. This is a matched pair and will be sold as a pair. We restored these and coated them with a clear brass lacquer. 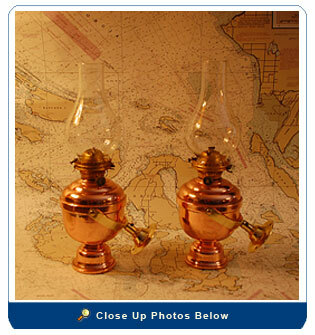 The globes are also original. Mouseover these thumbnails on the left for a closer look at another view of this item.